Change Your Mind, Renew Your Body, and Transform Your Life. 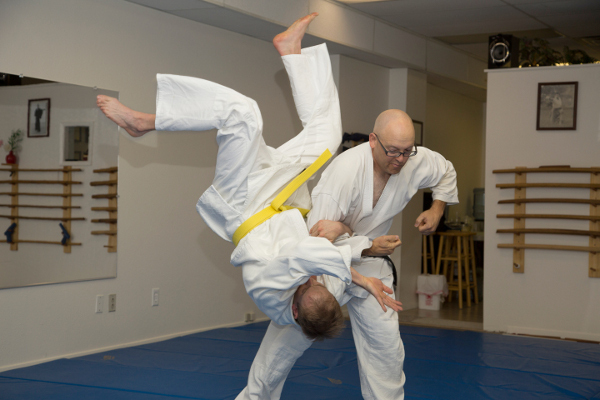 Aikido is a reality-proven system of self-protection using calm, non-violent, movement-based strategies that actually deliver what so many others have promised: using aggressive force to defeat itself. 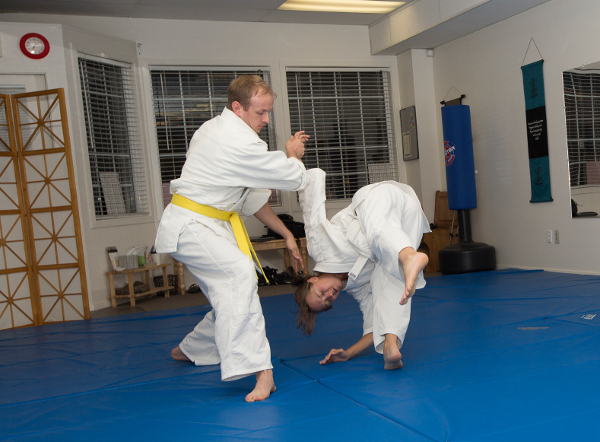 We offer progressive Aikido training and practice for adults and children. 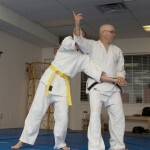 Do you want to learn self-protection, but don’t want to put up with macho foolishness to do it? 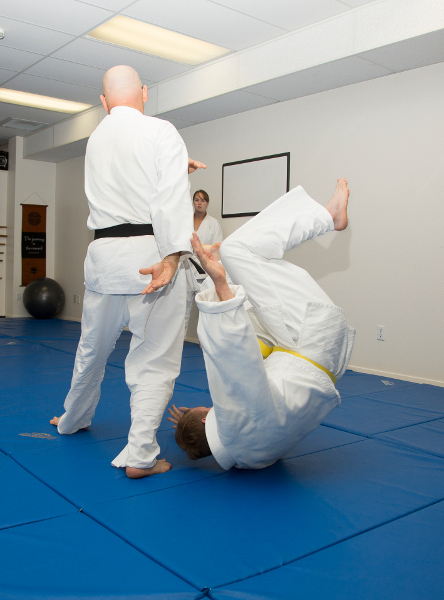 Do you want to learn actual protection skills – not the latest television “martial arts” fad or trophy-hunting games? Do you want to learn and practice practical self-protection while improving balance, flexibility, fitness, and awareness – in a friendly and supportive group? Do you want to learn self-development and achieve self-management for the real, daily world? If the answer to any of these questions is “YES”, then you may be right for our adults program. Has your son or daughter has experienced bullying problems? Do they have self-discipline challenges? Would they like to be more coordinated? Would you like them to be more motivated? 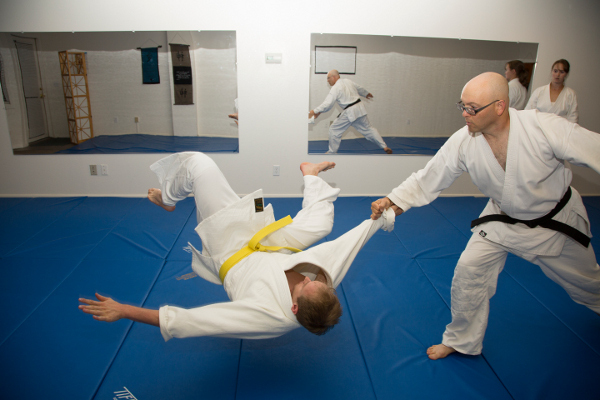 Drifting Sands / Klamath Falls Aikido offers a socially friendly and acceptable system of real-world self-protection along with a practical foundation of cutting-edge self-development – all in a fun and friendly environment. Schedule an interview to find out if you’re right for one of these programs. Send us an e-mail or call 541-883-2434. The Bully-Free™ Program is based on principles used by the U.S. Secret Service to protect the President. Bully-Free™ was designed by a former professional bodyguard who trained with former Secret Service agents who worked in the White House. Now a professional motivational trainer, John Bailey, has decades of hands-on experience with actual violence – and with profound motivational change. Bully-Free™ focuses on the core factors of safety, called ACM (awareness, communication, and movement). Students in the Bully-Free program learn to detect danger and manage their emotions through situational awareness, social awareness, and self-awareness. They learn anti-bullying DE-escalation skills that are both verbal and non-verbal. 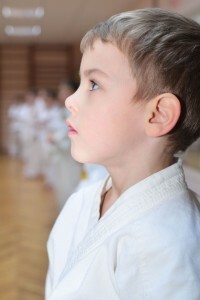 Bully-Free kids build a solid set of movement-based, socially-acceptable, non-violent physical skills for escaping and evading physical dangers. The Bully-Free™ Program incorporates parts of the Motivational Literacy™ System for motivation and personal development, allowing youngsters to understand the social forces behind bullying behavior at any age, so they can build a Bully-Free™ life. 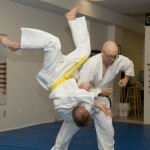 Retired private investigator and experienced professional bodyguard John Bailey serves as senior instructor of Drifting Sands / Klamath Falls Aikido. 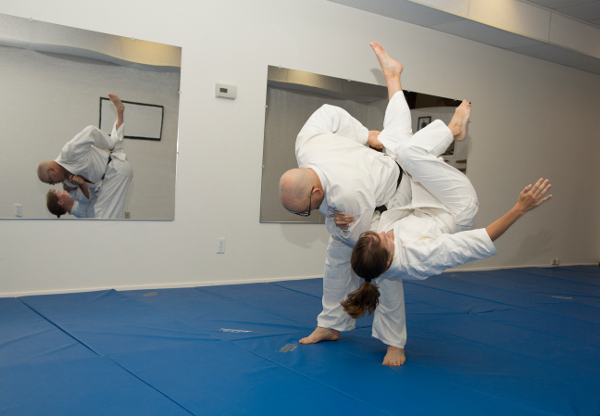 He began studying Aikido and Iaido in 1982 under the late Tony Graziano. 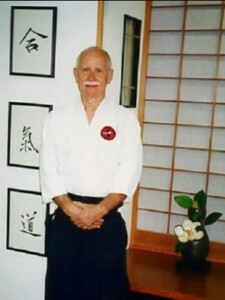 During the late 1980’s and early 1990’s he continued to practice Aikido under the late Dr. Tom Walker. During this time, he also acted as co-instructor with Graziano and Walker senseis, providing tactical training for law enforcement officers in Central Florida. He trained road officers, narcotics officers, tactical and SWAT officers, and court bailiffs. During the 1990’s, Bailey Sensei protected various clients, including Fortune 200 families in the USA, and acted as adjunct instructor of protective intelligence at the world-famous Executive Security International academy in Aspen, Colorado. 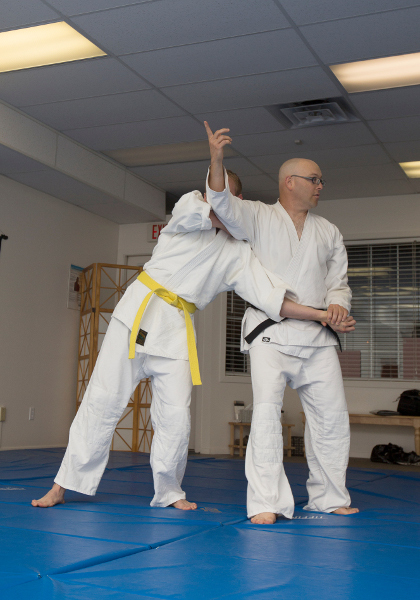 Since founding Drifting Sands / Oregon Aikido, he has continued to teach Aikido, Self-Defense, Handgun Safety, and Law Enforcement Defensive Tactics. Bailey is a life-long student of human behavior, including predatory behavior, bullying dynamics, and patterns of personal excellence. He is a certified Hypnotherapist, with a successful professional practice in that discipline. A successful entrepreneur, he provides professional and personal development coaching and public speaking in a variety of settings, internationally. 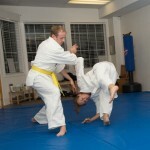 He has written for Martial Arts Professional Magazine and for Martial Arts Success Magazine. If you are looking for personal safety and personal development for yourself or your child, look around. Then, visit with Mr. Bailey. 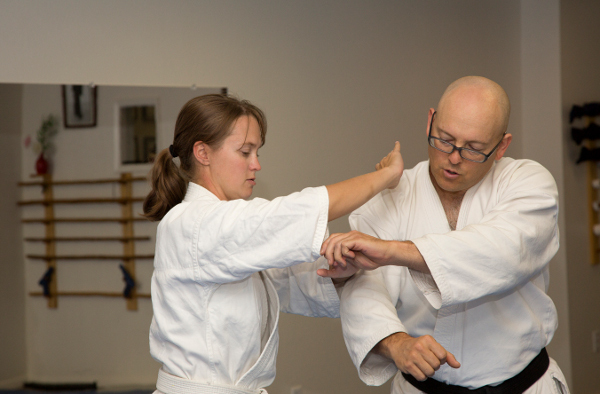 Keep the appointment and visit with the senior instructor. 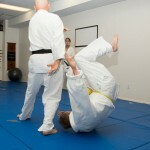 Participate in a few classes & Receive an invitation. 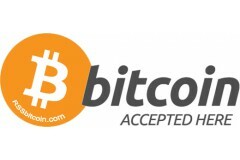 All applicants must be free from substance abuse issues – including tobacco in any form.